Bermuda-based PartnerRe announced a deal with Farmers Edge, a global leader in decision agriculture, that will help insurers to close the insurance gap among farmers across all continents. 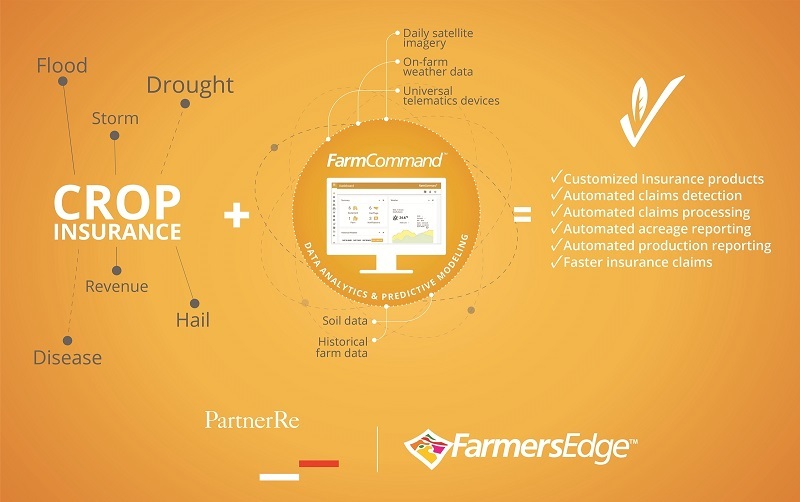 “This exclusive, four-year agreement between Farmers Edge and PartnerRe brings together precision farming technology and agriculture insurance in a landmark deal that will fundamentally advance the $5 trillion global food and agriculture industry,” PartnerRe said. “Under the terms of the agreement, PartnerRe and Farmers Edge will jointly develop new agriculture insurance products in main crop growing areas worldwide, aimed at addressing the specific needs and challenges of farmers. “For farmers, the insurance product with integrated precision-farming capabilities will improve the efficiency and sustainability of their operations, and will enable them to obtain insurance, which is customized to their individual needs and parameters. Insurers will also benefit from a more efficient loss adjustment process. “The Farmers Edge platform is a comprehensive turnkey system that includes: Variable Rate Technology, soil sampling and analysis, field-centric weather monitoring, in-field telematics and data transfer, daily satellite imagery, data analytics, predictive modelling, access to integrated farm management platform and real boots on the ground. “This first-of-a-kind deal with PartnerRe will have a tremendous impact on farmers as they will gain greater, customized insurance options based on better, more accurate data and simultaneously open up new financing options farmers need to grow their businesses,” said Wade Barnes, president and CEO of Farmers Edge. Rinat Bektleuov, Head of Agriculture at PartnerRe, said, “In recent years, precision farming has moved from a niche business to the mainstream as a stand-alone agritech industry, with great potential to become the new standard in crop production in the mid to long term.